Peterborough dances are held on the first Saturday of every month. The dance opens at 7:30 with a beginners workshop, and the dancing starts at 8:00. There is also a jam session for beginning and intermediate level musicians at 6:30. The callers and bands represent diverse choices from New England’s finest. Admission to the dance is $10 / $7 for students and senior citizens. There are also special dances during the year: notably the Fall Ball in October, Thanksgiving Eve dance,(NO THANKSGIVING EVE IN 2018), the Snow Ball in January, and the Play Ball in April. Look for details about the upcoming First Saturday dances in the MFS calendar and on Facebook. The Peterborough 1st Saturday Contra Dance was started in the 1980’s by Tod Whittemore, then from the Boston area. When Tod moved to the southwest, the dance was taken over by Steve Zakon-Anderson. In 2012, the monthly dance organization was moved to a committee of the Monadnock Folklore Society. Steve continues to be the primary caller, with guest callers at various times throughout the year. Steve is also the organizing force behind the annual Fall Ball, Thanksgiving Eve, Snow Ball and Play Ball dances. The Monadnock Folklore Society is proud to provide sponsorship for the Peterborough Dances, which are held in the lovely Peterborough Town House. For more information about the Peterborough dance, call 603-762-0235, or by Email. The Peterborough Town House is located at 1 Grove Street, Peterborough, NH 03458. Click here for directions. 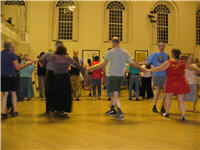 Contra dance is a fun, easy style of folk dance which has flourished in New England since the 1700s. Partners form lines and dance a short sequence of steps with their neighbors. At the end of the sequence, each couple progresses on to meet new neighbors. Over the course of the dance, each couple travels the length of the line and dances with every other couple. Check out Wikipedia and note that the photo is from Peterborough! And you can check out Google and YouTube, of course. From 7:30 – 8:00pm before every dance, the evening’s caller offers a workshop on the basic steps used in contra. Then, as the evening progresses, each new dance is taught with a brief walk-through. We also have a wonderful community of friendly, experienced dancers who welcome new dancers. You are welcome to bring a dance partner or a group of friends with you, but it’s not necessary – traditionally, dancers are encouraged to change partners throughout the evening. You can ask anyone you’d like to dance, you can accept a dance invitation from whomever you like, and you can also decline to dance as well. If you can walk and smile, you can contra dance! Our first Saturday contra dance always features wonderful live music drawn from the Irish, Scottish, English, and French Canadian traditions. Our live contra bands are drawn from regional and national touring groups, usually featuring fiddle, flute, or accordion, backed by piano, guitar, and/or bass. The Peterborough Town House is known across the country as a shining example of a New England dance hall. In fact, the Wikipedia entry for “contra dancing” shows a photo of this splendid space: https://en.wikipedia.org/wiki/Contra_dance. The most outstanding aspect of the Town House, from our perspective, is the dance floor. Its maple surface is perfect for contra dancing, with just the right mix of slide and bounce to provide for comfortable dancing. Moreover, the angled pattern of the floorboards forming a geometric shape is, to our knowledge, unique. The Monadnock Folklore Society presents contra dances in the Peterborough Town House on the first Saturday of every month where the average attendance is 50-100 people. In addition, MFS sponsors special 12-hour dances in the Fall and Winter. For these special events, dancers travel from all over the country and typical attendance over the twelve hours ranges from 300 to 500 people. At all of our dances, visitors typically arrive early, eating at local restaurants and visiting other Peterborough businesses. For the Fall Ball and Snow Ball, traveling dancers make a weekend of it, staying at local inns, motels and B&Bs. In this way, we feel that the contra dances provide an overall benefit to the town of Peterborough, in addition to preserving and promoting a local tradition. In 2015, the Monadnock Folklore Society collaborated with the Monadnock Center for History and Culture to mount an exhibit called “Gents Bow, Ladies Know How: Traditional Music and Dance in the Monadnock Region, 1750-2015.” Through our research, we became more aware of the long history of traditional dance in the Monadnock region and specifically in Peterborough. The tunes came here with the fiddles that travelled with their people to this new land. Like the people who sought new life, adventure, and freedom, the tunes were ready to lend their folk roots to be the foundation of something new. New communities, eager for diversion and cohesion, found both with the music and dance. French dancing masters roamed the colonial countryside, teaching the contredanse, which became contradance. These dances were appealing to the nascent democracy: the dancers were equal, with everyone in the set engaging with everyone else: the farmer, the banker, the blacksmith, the teacher. The dance served the additional function of teaching social graces and nurturing community.